The latest Casper APK 1.5.6.2 is now available. Have you heard about Snapchat? Of course, you have. One of the popular social media many people have in their smartphones. To support this social media, there is the application called Casper for Android. With Casper, there are so many things that you can do to make your Snapchat getting greater such as send Snaps and Save snaps. Do you want to get a further information? The explanation below will enlarge your knowledge about this application. In Save Snaps, you are like a ghost in which you can stealthily the save media without the sender know that you have done it. Indeed, it is like a pleasure since you can make a jokes using this application, for instance to make a surprise thing for your friends and so on. Besides, you also can send pictures from the gallery. If in Snapchat, you cannot do it, by downloading this supporting feature, you can send the Snaps directly from the gallery. 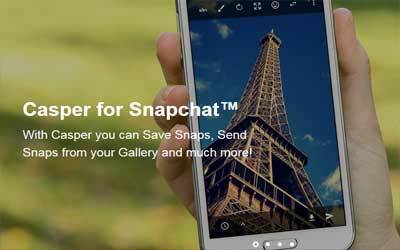 Moreover, this app can help you to do Forward Snaps. In this case, you are able to forward the Snaps having been received to the other people. That is why you will be easier in forwarding all of the Snaps to someone else. For the next Casper advantages, it can be the filters to tweak your photos look by using one of the filters provided. Then, to make the professional media, the slide filters which is like GeoFilters can be for the advanced users. The hundred up to thousand stickers can be found here to create an interesting Snaps. With those stickers, you can express what you want to express toward other people.